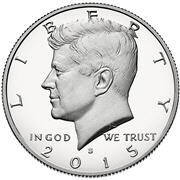 Soon after John F Kennedy was assassinated in 1963, the US Mint decided to commemorate the late President with a coin. JFK’s widow, Jacqueline Kennedy decided that her husband portrait should replace the image of Benjamin Franklin on the half dollar and leave George Washington on the quarter. 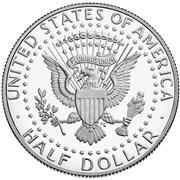 The Kennedy Half Dollar was first minted in 1964 as a 90% silver coin, and has been minted ever since (although today it is a copper-nickel alloy). 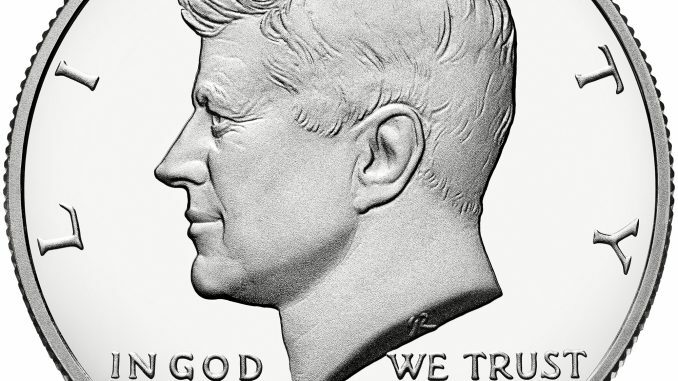 The Obverse was by Gilroy Roberts and depicts a bust of President Kennedy. The Reverse was by Frank Gasparro and shows the Presidential Coat of Arms. In 1975 and 1976 the reverse showed Philadelphia’s Independence Hall to commemorate the United States Bicentennial. Although the coin was in general circulation, due to the popularity of Kennedy the coin was quickly horded away by much of the population. 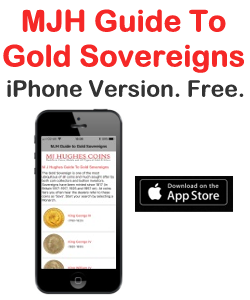 As silver prices were rising at the time, many coins were also stored and subsequently melted for the metal price. This prompted the US Mint to reduce the silver content to 40% for the 1965 minting. 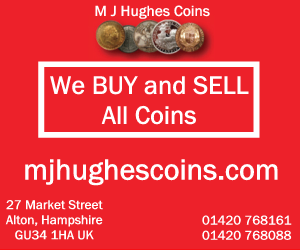 Coins minted between 1965 and 1970 are described as ‘Silver Clad’. By 1971 the actual silver content was eliminated altogether and the coin was made from an alloy of copper (75%) and nickel (25%) on a copper core. A few coins (1971-D and 1977-D) were minted as silver clad by error. 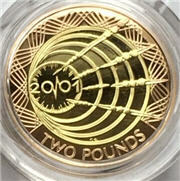 Current coins for circulation are still like this although Silver proofs are available for collectors in boxed sets. 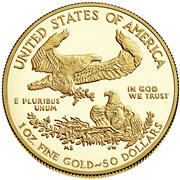 In 2014 to celebrate the coin’s 50th anniversary, a pure gold proof version was also struck.